There are a couple of interesting moments in this story. First, when the quail hunter sees what the birds are doing, he doesn’t flinch. He assumes that sooner or later the harmony that enables the birds to outwit him will not last. He seems to have a pretty good idea about the nature of the quails in that community. The second interesting moment is when the Bodhisatta sees the dispute, and he simply leaves. This is a common theme in the Buddha’s teaching. The hardest thing to do when there is a problem is nothing, but that is often the best choice. The Bodhisatta has enough discernment to see that there is nothing to be done. This couples the qualities of discernment (wisdom) and equanimity. We often do harm by trying to intervene when it is inappropriate. The reason that we do this is the impulse to act. We need equanimity to calm these impulses, and we also need wisdom to see what actions are skillful and which ones are not. “While harmony reigns.” This story was told by the Master while living in the Banyan Grove near Kapilavatthu. It is about a squabble over a head scarf, as will be related in the Kuṇāla Jātaka (Jātaka 536). On this occasion, however, the Master said this to some royal kinsfolk: “My lords, strife among kinsfolk is unseemly. Yes, in bygone times, animals, who had defeated their enemies when they lived in harmony, came to utter destruction when they argued.” And at the request of his royal kinsfolk, he told this story of the past. Once upon a time when Brahmadatta was King of Benares, the Bodhisatta was born as a quail, and he lived in the forest at the head of many thousands of quails. In those days there was a fowler who caught quails who came to that place. He used to imitate the song of a quail until he saw that the birds had gathered together. Then he would throw his net over them and lash the sides of the net together to trap them. Then he crammed them into a basket and went home to sell his prey for a living. “Very good,” they said, and they all nodded in agreement. The next day, when the net was cast over them, they did just as the Bodhisatta had told them. They lifted up the net, flew off, and landed in some thorn bushes. Then they escaped from underneath the net. The fowler eventually found his net, and while he was still disentangling it, evening came on, and he went away empty-handed. While harmony reigns, the birds carry off the net. When quarrels arise, they’ll fall prey to me. Not long after this, one of the quails landed accidentally on another quail’s head. “Who landed on my head?” this quail cried angrily. “I did, but I didn’t mean to. Don’t be angry,” said the first quail. But despite this answer, the other quail remained angry. They began to taunt each other, saying, “I suppose it is you who single-handedly lifts up the net!” As they argued with one another, the Bodhisatta thought to himself, “There is no safety with one who is quarrelsome. The time has come when they will no longer lift up the net, and as a result they will come to destruction. The fowler will get his opportunity. I can stay here no longer.” And with that he with his following went elsewhere. 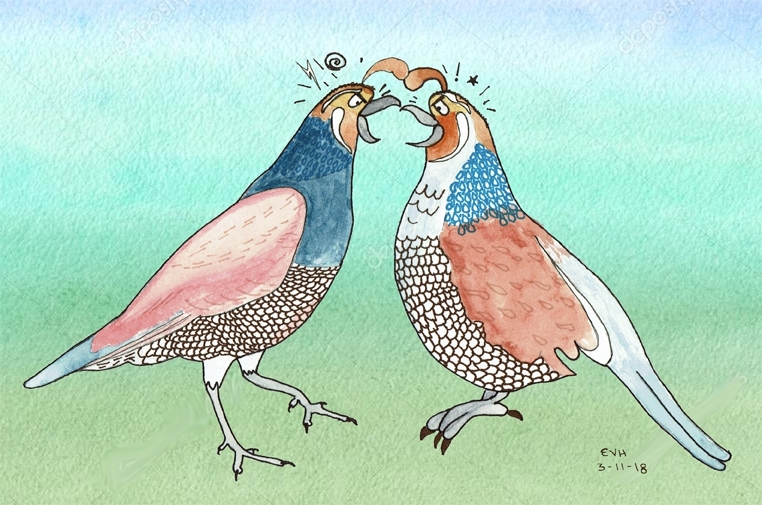 Figure: Oh, Those Quarreling Quail! But while they were needling each other to lift the net, the fowler himself lifted the net for them. He crammed them into his basket and took them home. And his wife’s face was wreathed with smiles.